Your pain is the breaking of the shell that encloses your understanding. Even as the stone of the fruit must break, that its heart may stand in the sun, so must you know pain. Solitude has soft, silky hands, but with strong fingers it grasps the heart and makes it ache with sorrow. Your thought describes laws, courts, judges, punishments. Mine explains that when man makes a law, he either violates it or obeys it. If there is a basic law, we are all one before it. He who disdains the mean is himself mean. He who vaunts his scorn of the sinful vaunts his disdain of all humanity. If in the twilight of memory we should meet once more,we shall speak again together and you shall sing to me a deeper song. And if our hands should meet in another dream we shall build another tower in the sky. Since your last hasty visit and our brief welcome. When your tide lifted us up. Love is a gracious host to his guests though to the unbidden his house is a mirage and a mockery. Now you would have me explain the miracles of Jesus. We are all the miraculous gesture of the moment; our Lord and Master was the centre of that moment. Yet it was not in His desire that His gestures be known. My friend, I am not what I seem. Seeming is but a garment I wear — a care-woven garment that protects me from thy questionings and thee from my negligence. I would not have thee believe in what I say nor trust in what I do — for my words are naught but thy own thoughts in sound and my deeds thy own hopes in action. I am the lover's gift; I am the wedding wreath; I am the memory of a moment of happiness; I am the last gift of the living to the dead; I am a part of joy and a part of sorrow. 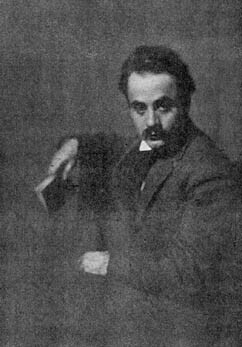 Bio: Kahlil Gibran was a Lebanese-American artist, poet, and writer of the New York Pen League.